Note: The Martin Model America 1 is in no way associated with the obscure “Model America” that C. F. Martin & Co. built in 1906. 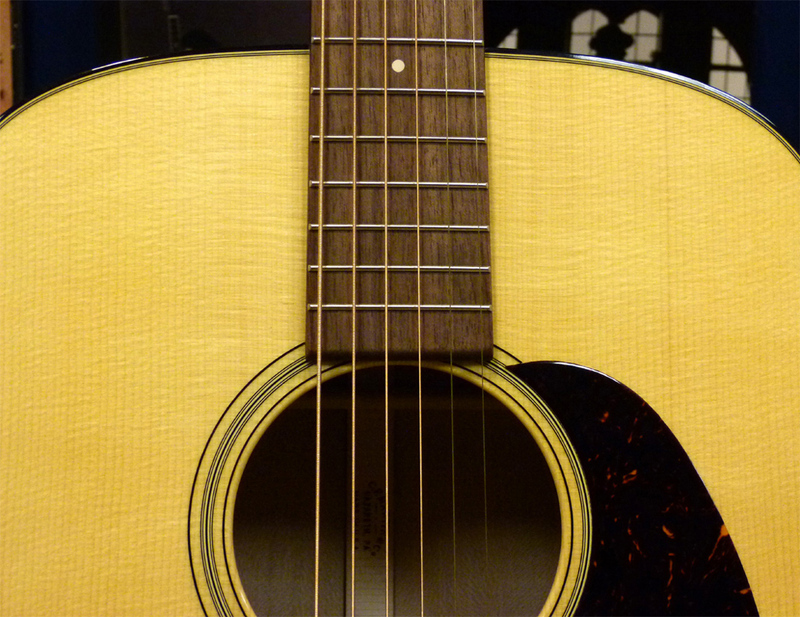 The Martin Model America 1 is a dreadnought-size model made by America‘s oldest guitar builder, featuring environmentally sustainable solid tonewoods commonly found within the United States, constructed to the specifications of their Standard Series of professional-level acoustic guitars. It is hoped the 1 signifies that this is but the first in a series of Model America designs, as it is a delightfully successful jim-dandy of a musical instrument. The Model America 1 has a fundamental sound that is fundamentally sound – its notes pronounced with pretty clarity. A satisfying bass response on one side is matched on the other by strong yet pure trebles that project with authority and beauty, and sustain with a glimmer like sunlight on gently rippling water. In between is a roomy mid-range with crisp top notes over an open cellar, where the classic Martin bottom-end undertone wafts toward, but does not intrude upon the reflecting, defined notes of the unwound treble strings, which keep their tonal signature even as they recede, down into the open, resonating voice. Some may notice the guitar I reviewed has different tuners than the production run. 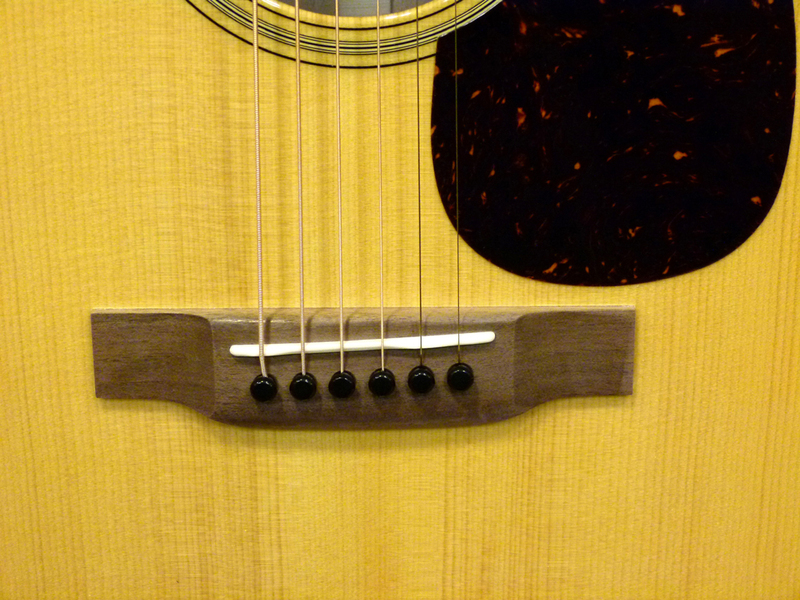 After the NAMM show, it was decided to go with the vintage-style Martin brand tuners used on the Standard D-18. I assume this was done in an effort to stay within a certain price point, the same reason they are using white Corian for the dot fret markers rather than mother-of-pearl. But otherwise it is identical to the Standard D-18 – um, except for the woods. The high performance neck is made from cherry, which by the way is certified as being harvested from woodlands maintained in a manner that follows guidelines of the Forest Stewardship Council for environmentally responsible forestry practices. And while cherry is quite similar to mahogany in terms of density, the black walnut fingerboard and bridge are much closer to the rosewood that formerly appeared on the Standard D-18, rather than the denser ebony used today. And the black walnut on the prototype that I reviewed had a dusty milk chocolate hue, with some darker peppery streaks on the fingerboard that added some extra texture. Overall, the Modern America 1 is an attractive guitar with a slightly different appearance in terms of its visual color scheme than other Martins made with the appointments and construction specs of a D-18. But what makes it truly different from a D-18 or any other guitar in Standard Series, is the combination of sycamore back and sides with an Adirondack spruce soundboard. Martin has produced a few sycamore models in recent years, and I have found the wood on all of them to be quite attractive. When quartersawn, the tan and light brown wood has all sorts of nice looking rays and buttons and ferny lace, with some logs producing highly-figured wood, while others provide uniformed grain with subtler looks. The American sycamore is a species of plane tree (Platanus occidentalis,) not to be confused with the tree the British call a sycamore ‎(Acer pseudoplatanus,) also known as the German maple. But, as a timber and tonewood, sycamore has a density and stability similar to the maple family. So, it makes sense that it would have similar tonal properties. However, American sycamore has its own sonic personality. While it has a fundamental voice like maple, which is primarily about the pretty top notes and their immediate harmonic sympathetics, it also has warmer tonal coloring overall and more than enough bass response to work very well for a dreadnought-size Martin. Yet it has a less-complex midrange, bass, and harmonic sympathetics than the rosewoods, walnuts, or koa. This has led some to say it sounds like a cross between maple and mahogany. But that is about as true as when people claim koa or walnut are like a cross between mahogany and rosewood. In other words, it is not really specific enough to mean anything useful. Sycamore’s voice is its own thing with its own tonal signature, and one I happen to like the more I hear it. I remember the very first Martin I played made out of Sycamore. 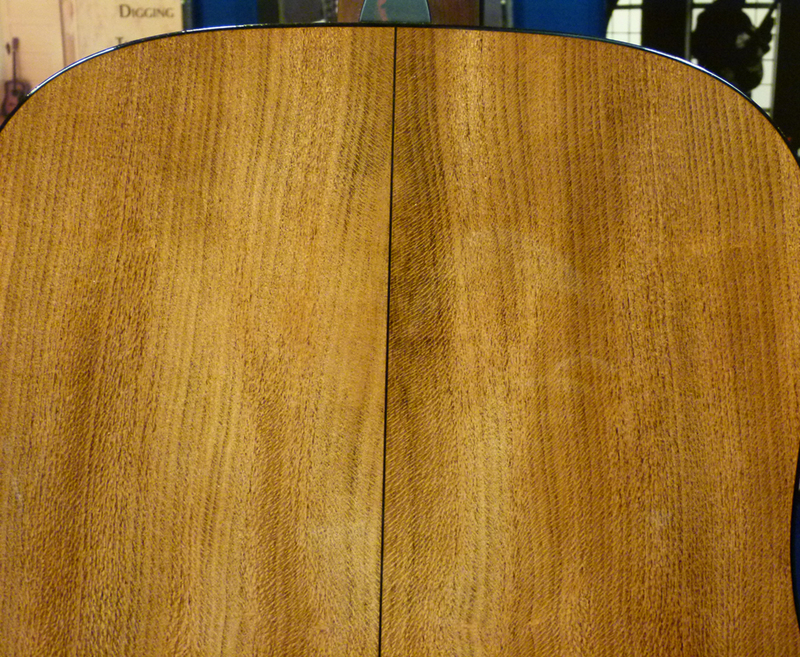 It was a “sound test guitar,” which Martin’s Alternative Wood Specialist, Michael Dickson, defined as, “Not a Research and Development guitar or a prototype, but a guitar we build as a D-14 to hear what a wood sounds like and compare it to similar guitars made out of other woods.” It was clear and clean sounding, with unfettered fundamental notes, and with construction and finish, etc. below Standard Series level. I thought it interesting but it didn’t really wow me. Although I know some people liked it much more, including the fella who was quite grumpy when Martin refused to accept his deep-pockets offer to buy it. As I recall, he actually kissed the guitar goodbye. Within the other sycamore Martins that followed, I enjoyed the CEO-8 for its unique personality and alternative sound, looks, and feel, just as I have enjoyed the new 16 Series dreads made from sycamore, and of course the D-18 Sycamore limited edition, which had a VTS Sitka top. But I like the Model America 1 more than any sycamore guitar I have heard thus far – by far. I was not expecting to like it, frankly, when I first heard about this model before its Summer NAMM debut, because of its top wood. Pairing this dreadnought-size sycamore body with a soundboard of Adirondack red spruce turned out to be an inspired choice. I very much love the inherent strength to the unwound treble notes, and their liquid chrome kind of ring, which stays very much defined as the sustaining notes decay. Typically, I do not go in for Adirondack spruce topping tonewood of lesser harmonic complexity. I prefer the fatter mid-range fundamentals and warming quality of Sitka for mahogany guitars, and pairing maple with Engelmann or European spruce, because they add their soft-focus tonal halo that glows in and around the notes, creating some extra presence to the undertone and sympathetics of an otherwise very fundamental voice. I prefer Adirondack spruce tops on tonewood with a lot of complex overtones and warmth, like Macassar ebony or the rosewoods, which do not need any additional presence or complexity added from the topwood. To my way of thinking, Adirondack does not add tonal coloring to a guitar; so much as it defines, enhances, and promotes the sonic properties inherent in the tonewood used for the back and sides. It acts like a transparent, high-resolution lens that gets every detail possible out of the guitar’s voice. Or to use a different metaphor, it has the wide dynamic range of a large diaphragm condenser microphone that captures and amplifies the highest highs and the lowest lows, while leaving the mids breathy and transparent. But some guitars with Adirondack tops can be a bit too fundamental to my ear and not that interesting. The Model America 1 is very interesting and very attractive. There is a firmness to the sycamore trebles and a fullness to the bass notes, and a chiseled definition to the center of the voice, thanks to the Adirondack spruce top. The Adirondack effect makes the center of the voice quite straightforward, leaving lots of space behind, in that almost “vintage openness” sort of way. And that allows the bass notes to come off all the rounder and fuller, reaching deep into the voice without flooding it, while those trebles gleam and swell and sing, and then recede relatively slowly, because they aren’t crowded by the lower undertone. And be it bass or treble, the notes reflect like lights and shadows at play, down in that spacious cellar, even as the top notes from the strings ring out into the room, loud and clear. It’s like the Adirondack spruce found all the best stuff there was to find in the sycamore and made the most of it. Which, I guess, is what Adirondack does best. Rosewood lovers may find the voice of this new model a bit uncomplicated for their liking. And yet, they may also like it very much as an alternative kind of sound, in the same way they can like mahogany. But when it comes to lovers of mahogany with Adirondack spruce, those who get to see one of these guitars in a shop and play it alongside a D-18 Authentic or D-18 GE or CEO-7 may start to appreciate more the clear musical virtues of sycamore. 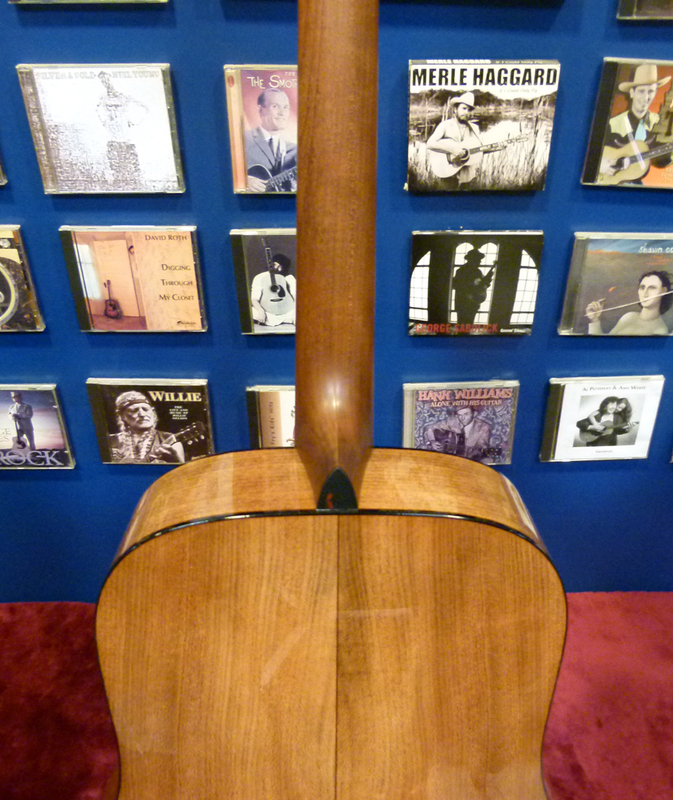 Martin’s revamped 16 Series, called the Americana Series, also focuses on domestic American tonewoods. Each has a Sitka spruce top, but a different wood for the sides and back, depending upon the body size, and all for a very reasonable price. The D-16E and DC-16E are made of sycamore, with shallow sides of 000-depth, to help those acoustic-electric instruments combat the feedback issues that can plague dreadnoughts when performing on large concert stages. But to my ear, the Model America 1 is a much more impressive musical instrument, with a much richer, fuller voice. It seems to me that the Model America Series, if it becomes a series, takes this homegrown American wood concept up to the level of the very best Martins that set the industry standard. And that is a very good idea. 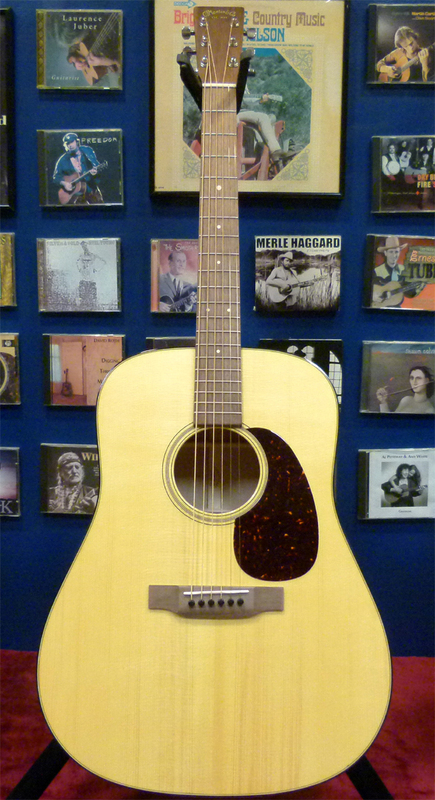 The Model America 1 is a traditional dreadnought-size acoustic guitar with a righteous acoustic voice, and the full-blown build of a traditional Martin guitar, made with the same hand-fitted dovetail neck joint, solid neck block, and full gloss nitrocellulose finish used on the top-of-the-line D-45. And then adds to it the Adirondack spruce top and bracing of a vintage Martin. Granted, this guitar is a limited edition. But it is still the first guitar in the Standard Series to have an Adirondack spruce top, not to mention the other alternative woods involved. Its impressive voice makes clear to me just how much the overall construction of an instrument matters, not just what woods are used. But the Model America 1 is also showing the world that there will still be plenty of very fine Martins to be had, should the day ever come when exotic tropical woods like mahogany and ebony are no longer available. And for those who like the fact all the woods on this model are “made in America,” they can have one of these fine Martins right here and now. And the best part? There is no set cap to this edition. It should remain in the catalog a good while, so long as people keep buying it. I can hardly wait to see what the Model America 2 will be like. 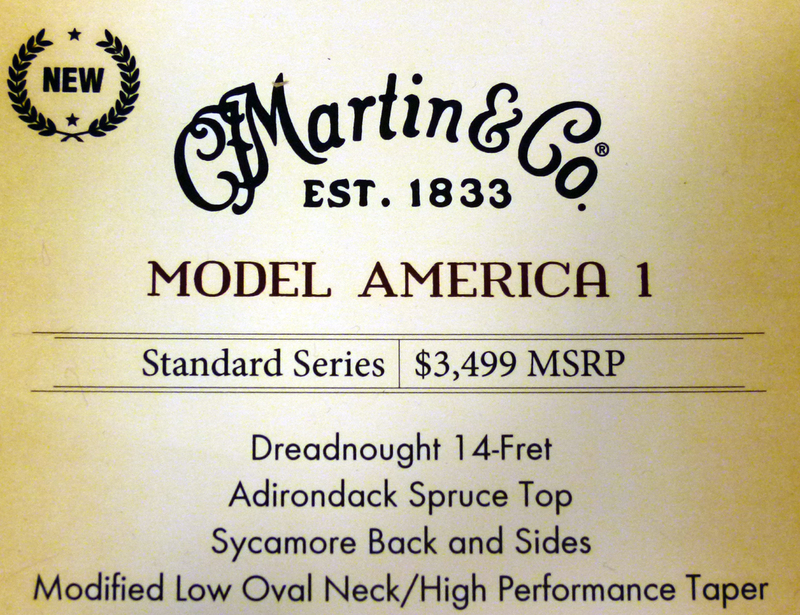 Call your Martin dealer and ask about their best price. Gary: A guitar with those specs already exists, at least as far as the cherry back and sides are concerned, in the Martin SWDGT, one of the first all-sustainable woods guitars that Martin made. I just sold mine after getting the America 1, though, as I felt I no longer have a need for a second dreadnaught. The America 1 is a killer guitar all around, and I can’t think of any way it could possibly be improved, with one exception: A larger soundhole, as in the D-18 Clarence White model, would make this my all-time favorite dreadnaught. No, The SWDGT (as well as the current OME Cherry) are not in America 1’s construction class as indicated by their respective prices. Martin’s cherry guitars have been built to a price point rather than building the best guitar they know how. For starters, neither cherry guitar has a dovetail neck joint which is the starting point for Martin’s best effort. The A1 gave hope that they would invest in a high quality series with A2 and A3 etc to follow. Alas, I understand Martin has abandoned ship already by discontinuing the A1. Gary is correct. The cherry SW models were originally made with the M&T neck joint and simplified bracing, and later the Simple Dovetail Neck Joint, which is definitely an improvement but not the same thing as the full, traditional dovetail joint. I felt the latest cherry OM was the best sounding cherry guitar Martin has yet made. But that does not mean the other cherry models are not very good guitars. BUt I would love to see them make a D-18 cherry, with the full Standard Series construction, and see how that turns out. But I think Martin doesn’t believe they would sell at the price point required. America 2 surely must be back and sides of Black Cherry to go with that gorgeous neck. Just subscribed to your UT channel.